Next month, Frank Castle and Matt Murdock will battle each other for the soul of Hell’s Kitchen in Daredevil season 2, but it won’t be the first time the Man Without Fear has gone up against the Punisher. 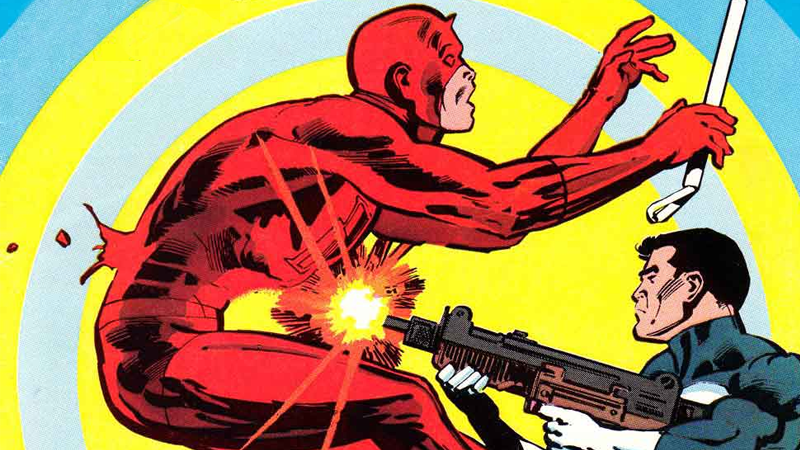 Want to know more about Daredevil and Punisher’s long history together before the show returns? Here’s a few comics you should read. There’s a certain formula to a Daredevil and Punisher crossover. Frank and Matt both end up tailing the same criminal, they argue whether bringing them to trial or just murdering them instead is the right thing to do, they punch each other a bit, agree to disagree and team up, and bag the criminal in the end. “The Bully” is no different, but with some interesting twists. This story is curious because of its shifting perspectives—it’s actually a retelling of a story told in The Punisher #10, released the same month as Daredevil #257, except from the perspective of Daredevil and the criminal he and Punisher are both on the hunt for, Alfred Coppersmith. In a move that’s tonally perfect for the characters, each issue paints Coppersmith in a different light based on each vigilante’s worldview. In Punisher #10, Coppersmith is a simple, villainous entity—a murderer and threat that has to be eliminated, like so many of Frank’s foes. But in Daredevil, Nocenti has Matt investigate why Coppersmith turned to crime, revealing a picture of a man angry at an evolving world around him, and making him a more sympathetic figure who deserves the right to a day in court. When Daredevil and Punisher inevitably come to blows, we get to see it from Coppersmith’s perspective, his own internal monologue painting Matt and Frank, and their strange relationship with each other, in a different light. The Punisher wants to fight crime through murder; Daredevil wants to fight it through the court of law. These diametric opposites sit at the heart of virtually every tale about the two characters. It’s a debate between the morality and ethics of heroism and vigilantism. Means & Ends doesn’t particularly offer anything fresh on that age-old clash between Punisher and Daredevil, but Lapham (best known for his excellent crime-focused independent series Stray Bullets) executes the familiar story incredibly well. Set in a Hell’s Kitchen without the Kingpin, Frank and Matt begrudgingly find themselves both trying to bring down Hammerhead and Jackal, who have usurped the neighborhood’s criminal operations. Lapham doesn’t just offer a deep examination the different moralities Daredevil and Punisher represent—There’s also a superb throughline, which looks at the impact the two characters have on the ordinary people of Hell’s Kitchen. It’s a sort of tragic, human crime drama that wouldn’t look out of place in the pages of Stray Bullets. Many stories about Matt and Frank together are laser-focused on having the two vigilantes debate, bounce off, and fight each other—Means & Ends might not have much new to say on that debate, but it’s a well-crafted take with the added bonus of bringing a wider perspective to the moral battle between the characters. The Omega Effect shakes up the typical Daredevil/Punisher team-up by throwing in a character with ties to them both: Spider-Man. Peter Paker’s presence naturally lends a slightly lighter tone to this short saga than many of Daredevil or Punisher’s past outings together, in which Daredevil comes into possession of a flash drive filled with information on the biggest criminal organizations of the Marvel universe. It’s a refreshing team-up from most of their stories. in which even the Punisher can’t kill people, thanks to the presence of Daredevil and Spider-Man on his shoulders advocating a non-violent solution for what to do with the drive. It’s strange to have an adventure with Matt and Frank that feels fun rather than needlessly grim. It works here by turning the usual debate between Punisher and Daredevil about their approaches on its head, Instead of the usual Matt-Frank fisticuffs, the battle takes place between Matt and Rachel Cole, the ally/apprentice that Punisher had taken on in Rucka’s series. Daredevil sees her as a proto-Punisher that he could redeem, unlike the lost cause of Frank. Devil by the Horns, a small part of Ennis’ larger, stellar “Welcome Back Frank” arc, is one thing we know the show is definitely going to pay homage to—and there’s good reason for that. It’s perhaps the most iconic of all Daredevil and Punisher team-ups, and unlike many of the duo’s encounters, the Punisher actually gets to come out on top. Punisher: If you don’t shoot you’ve got a death on your conscience. A death you could have prevented. If you do shoot, you’re a killer. Daredevil: What kind of choice is that...? Punisher: The one I make every time I pull the trigger. If you’re especially looking to know more about The Punisher before Daredevil season two, this is the story to read. Most Daredevil and Punisher stories are about posing Matt and Frank as complete opposites in their actions and morals, but this story from Brubaker and Lark’s run on Daredevil puts a different spin on the pair’s relationship by focusing on how Frank Castle really sees Daredevil. The culmination of Brian Michael Bendis’ run on Daredevil, Matt finds himself locked up on Ryker’s Island (not to be confused with Riker’s Island, the real New York’s main prison complex) alongside the criminals and supervillains that he helped put away as Daredevil. He’s pushed to the limits on the inside, as he tries to discover who killed his best friend Foggy. The Punisher hears that Matt has been locked up, and gets himself thrown in Ryker’s to help Matt survive. This adds a fresh element to the dichotomy between Castle and Murdock—a sense of respect that was never really there as part of their previous encounters. The two will probably never agree with each other’s methods, but it doesn’t mean they outright hate each other for it. Header Image Credit: Daredevil #183 (1982) cover by Frank Miller, marking the first time Daredevil and the Punisher met.